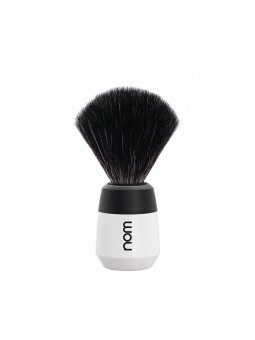 Mühle Nom Gustav Shaving Brush Pure Badger Black. Pure badger hair is solid quality for wet shavers who like a massaging effect while preparing to shave. The band of natural hair is machine-made, and the hairs are more flexible than bristles. The colour spectrum ranges from brownish-grey to black. 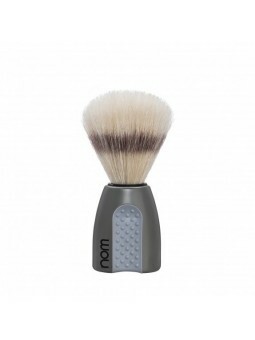 The Nom shaving brushes represent quality, design and functionality with one of the most competitive prices on the market. From one of the leading brands on the market, Mühle, they have a modern and innovative style that is perfectly combined with tradition and savoir-faire. The handle is finished in high-quality matt plastic, with its black colour to create a simply elegant design. Mühle Nom Gustav Shaving Brush Pure Badger Creme. Pure badger hair is solid quality for wet shavers who like a massaging effect while preparing to shave. The band of natural hair is machine-made, and the hairs are more flexible than bristles. The colour spectrum ranges from brownish-grey to black. 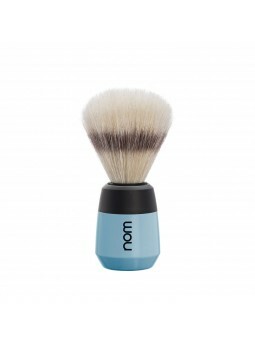 The Nom shaving brushes represent quality, design and functionality with one of the most competitive prices on the market. From one of the leading brands on the market, Mühle, they have a modern and innovative style that is perfectly combined with tradition and savoir-faire. The handle is finished in high-quality matt plastic, with a creme colour to create a simply elegant design. Mühle Nom Gustav Shaving Brush Pure Badger Havanna. Pure badger hair is solid quality for wet shavers who like a massaging effect while preparing to shave. The band of natural hair is machine-made, and the hairs are more flexible than bristles. The colour spectrum ranges from brownish-grey to black. 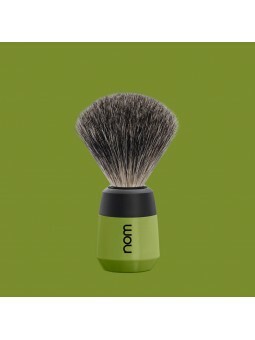 The Nom shaving brushes represent quality, design and functionality with one of the most competitive prices on the market. From one of the leading brands on the market, Mühle, they have a modern and innovative style that is perfectly combined with tradition and savoir-faire. The handle is finished in high-quality matt plastic, with its havanna colour to create a simply elegant design. Mühle Nom Lasse Shaving Brush Black Fibre Black. The handle is finished in high-quality matt plastic, and shows the great classic black colour, giving it a modern touch. Mühle Nom Max Shaving Brush Best Badger Lemon. The handle is finished in high-quality matt plastic, and shows the great yellow lemon colour, giving it a modern touch. Mühle Nom Lasse Shaving Brush Best Badger White. The handle is finished in high-quality matt plastic, and shows the great white colour, giving it a modern touch. 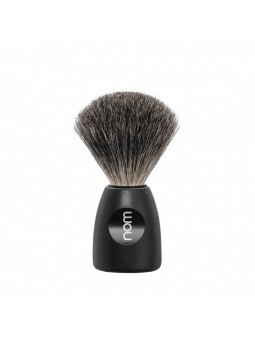 Mühle Nom Lasse Shaving Brush Black Fibre Black. Black fibre is purely vegan quality and has been developed especially for wet shaving. It is very similar to natural hair. They are a pleasure to the skin and at the same time they are more robust and flexible, for better efficiency use over time. The Nom shaving brushes represent quality, design and functionality with one of the most competitive prices on the market. From one of the leading brands on the market, Mühle, they have a modern and innovative style that is perfectly combined with tradition and savoir-faire. The handle is finished in high-quality matt plastic, and shows the great classic black, giving it a modern touch. 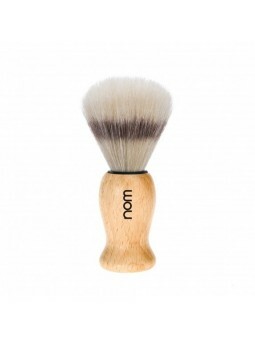 Mühle Nom Lasse Shaving Brush Black Fibre Lemon. Black fibre is purely vegan quality and has been developed especially for wet shaving. It is very similar to natural hair. They are a pleasure to the skin and at the same time they are more robust and flexible, for better efficiency use over time. The Nom shaving brushes represent quality, design and functionality with one of the most competitive prices on the market. From one of the leading brands on the market, Mühle, they have a modern and innovative style that is perfectly combined with tradition and savoir-faire. The handle is finished in high-quality matt plastic, and shows the great classic yellow, giving it a modern touch. 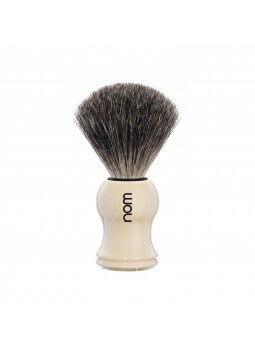 Mühle Nom Lasse Shaving Brush Black Fibre White. Black fibre is purely vegan quality and has been developed especially for wet shaving. It is very similar to natural hair. They are a pleasure to the skin and at the same time they are more robust and flexible, for better efficiency use over time. 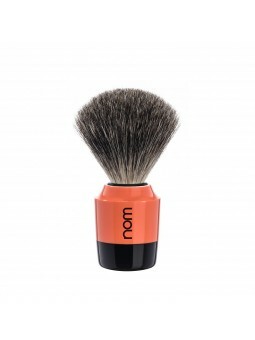 The Nom shaving brushes represent quality, design and functionality with one of the most competitive prices on the market. From one of the leading brands on the market, Mühle, they have a modern and innovative style that is perfectly combined with tradition and savoir-faire. The handle is finished in high-quality matt plastic, and shows the great classic white, giving it a modern touch. Mühle Nom Lasse Shaving Brush Natural Bristle White. The natural bristle hair gives a vigorating massage effect. Together with the durability of the fibres and its special functionality with lathering, it is the ideal option to start in the world of classic shaving. The Nom shaving brushes represent quality, design and functionality with one of the most competitive prices on the market. From one of the leading brands on the market, Mühle, they have a modern and innovative style that is perfectly combined with tradition and savoir-faire. The handle is finished in high-quality matt plastic, with a white colour to create a simply elegant design. 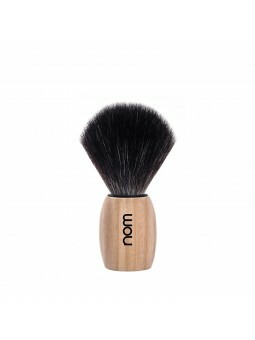 Mühle Nom Max Shaving Brush Black Fibre Black/Creme. Black fibre is purely vegan quality and has been developed especially for wet shaving. It is very similar to natural hair. They are a pleasure to the skin and at the same time they are more robust and flexible, for better efficiency use over time. The Nom shaving brushes represent quality, design and functionality with one of the most competitive prices on the market. From one of the leading brands on the market, Mühle, they have a modern and innovative style that is perfectly combined with tradition and savoir-faire. The handle is finished in high-quality matt plastic, and shows the great classic combination black/creme, giving it a modern touch. 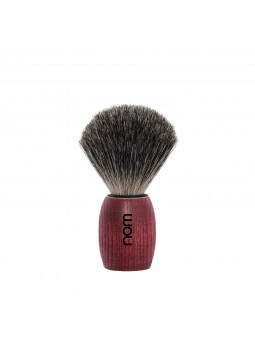 Mühle Nom Marten Shaving Brush Natural Bristle Black/Grey. The natural bristle hair gives a vigorating massage effect. Together with the durability of the fibres and its special functionality with lathering, it is the ideal option to start in the world of classic shaving. The Nom shaving brushes represent quality, design and functionality with one of the most competitive prices on the market. From one of the leading brands on the market, Mühle, they have a modern and innovative style that is perfectly combined with tradition and savoir-faire. The handle is finished in high-quality matt plastic, combining black and grey to create a simply elegant design. 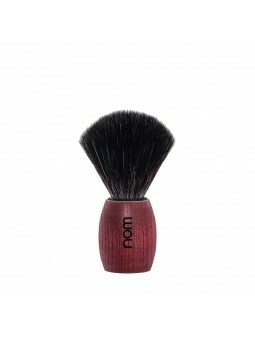 Mühle Nom Marten Shaving Brush Pure Badger Black/Coral. Pure badger hair is solid quality for wet shavers who like a massaging effect while preparing to shave. The hairs are more flexible than bristles. The colour spectrum ranges from brownish-grey to black. 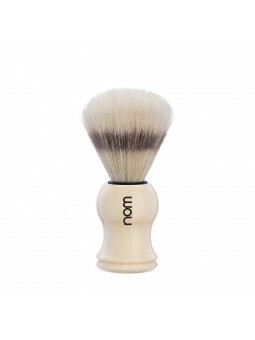 The Nom shaving brushes represent quality, design and functionality with one of the most competitive prices on the market. From one of the leading brands on the market, Mühle, they have a modern and innovative style that is perfectly combined with tradition and savoir-faire. The handle is finished in high-quality matt plastic, combining black and coral to create a simply elegant design. Mühle Nom Max Shaving Brush Black Fibre White. Black fibre is purely vegan quality and has been developed especially for wet shaving. It is very similar to natural hair. They are a pleasure to the skin and at the same time they are more robust and flexible, for better efficiency use over time. The Nom shaving brushes represent quality, design and functionality with one of the most competitive prices on the market. From one of the leading brands on the market, Mühle, they have a modern and innovative style that is perfectly combined with tradition and savoir-faire. The handle is finished in high-quality matt plastic, and shows the great classic combination black/white, giving it a modern touch. Mühle Nom Max Shaving Brush Natural Bristle Blue. The natural bristle hair gives a vigorating massage effect. Together with the durability of the fibres and its special functionality with lathering, it is the ideal option to start in the world of classic shaving. 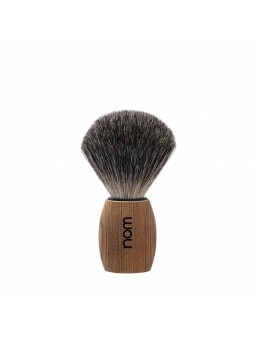 The Nom shaving brushes represent quality, design and functionality with one of the most competitive prices on the market. From one of the leading brands on the market, Mühle, they have a modern and innovative style that is perfectly combined with tradition and savoir-faire. The handle is finished in high-quality matt plastic, combining black and light blue to create a simply elegant design. Mühle Nom Max Shaving Brush Black Fibre Olive. Black fibre is purely vegan quality and has been developed especially for wet shaving. It is very similar to natural hair. They are a pleasure to the skin and at the same time they are more robust and flexible, for better efficiency use over time. 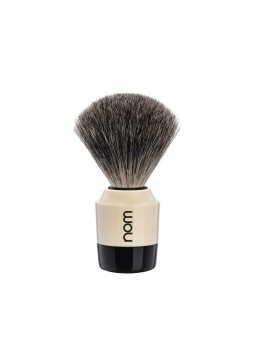 The Nom shaving brushes represent quality, design and functionality with one of the most competitive prices on the market. From one of the leading brands on the market, Mühle, they have a modern and innovative style that is perfectly combined with tradition and savoir-faire. The handle is finished in high-quality matt plastic, and shows the great classic olive colour, giving it a modern touch. 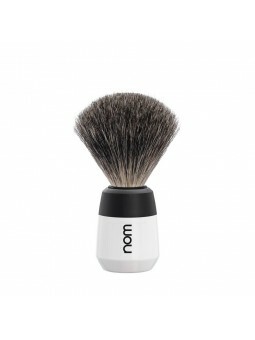 Mühle Nom Max Shaving Brush Pure Badger Plastic White. Black fibre is purely vegan quality and has been developed especially for wet shaving. It is very similar to natural hair. They are a pleasure to the skin and at the same time they are more robust and flexible, for better efficiency use over time. The Nom shaving brushes represent quality, design and functionality with one of the most competitive prices on the market. From one of the leading brands on the market, Mühle, they have a modern and innovative style that is perfectly combined with tradition and savoir-faire. 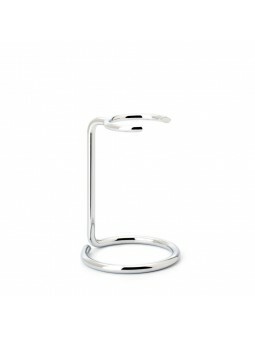 The handle is finished in high-quality matt plastic, and shows the great classic white colour, giving it a modern touch. Mühle Nom Ole Shaving Brush Black Fibre Ash. Black fibre is purely vegan quality and has been developed especially for wet shaving. It is very similar to natural hair. They are a pleasure to the skin and at the same time they are more robust and flexible, for better efficiency use over time. The Nom shaving brushes represent quality, design and functionality with one of the most competitive prices on the market. From one of the leading brands on the market, Mühle, they have a modern and innovative style that is perfectly combined with tradition and savoir-faire. The handle is finished in high-quality natural wood, and shows the great classic ash colour, giving it a modern touch. 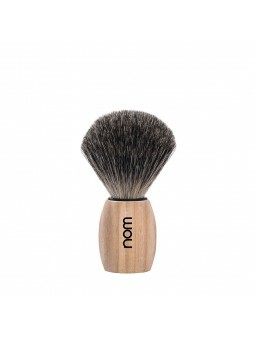 Mühle Nom Ole Shaving Brush Natural Bristle Pure Ash. The natural bristle hair gives a vigorating massage effect. Together with the durability of the fibres and its special functionality with lathering, it is the ideal option to start in the world of classic shaving. The Nom shaving brushes represent quality, design and functionality with one of the most competitive prices on the market. From one of the leading brands on the market, Mühle, they have a modern and innovative style that is perfectly combined with tradition and savoir-faire. The handle is finished in high-quality natural wood, with its spruce colour to create a simply elegant design. Brocha de Afeitar NOM Tejón Gris serie Ole Madera Burdeos. Calidad excepcionaly un suave efecto masaje, el tejón gris natural es especialmente flexible y absorbe la cantidad necesaria de agua para formar una rica espuma. Las Brochas de afeitar Nom son un claro exponente de calidad, diseño y funcionalidad con uno de los precios más competitivos del mercado. De la mano de una marca referente del sector, Mühle llegan al usuario con un estilo moderno, innovador y actual que convive con la tradición y el saber hacer. The handle is finished in high-quality natural wood, with its ash colour to create a simply elegant design. Mühle Nom Ole Shaving Brush Natural Bristle Spruce. The natural bristle hair gives a vigorating massage effect. Together with the durability of the fibres and its special functionality with lathering, it is the ideal option to start in the world of classic shaving. The Nom shaving brushes represent quality, design and functionality with one of the most competitive prices on the market. From one of the leading brands on the market, Mühle, they have a modern and innovative style that is perfectly combined with tradition and savoir-faire. Mühle Nom Ole Shaving Brush Pure Badger Blushed Ash. Pure badger hair is solid quality for wet shavers who like a massaging effect while preparing to shave. The band of natural hair is machine-made, and the hairs are more flexible than bristles. The colour spectrum ranges from brownish-grey to black. 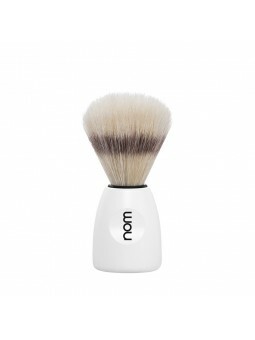 The Nom shaving brushes represent quality, design and functionality with one of the most competitive prices on the market. From one of the leading brands on the market, Mühle, they have a modern and innovative style that is perfectly combined with tradition and savoir-faire. Mühle Nom Theo Shaving Brush Pure Bristle Dark Ash. 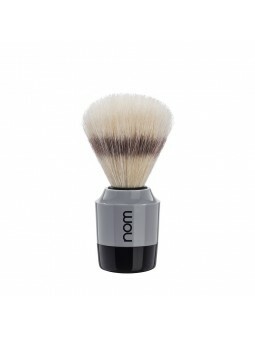 Nom Shaving Brush Pure Bristle Handle Plastic Tortoise Shell. 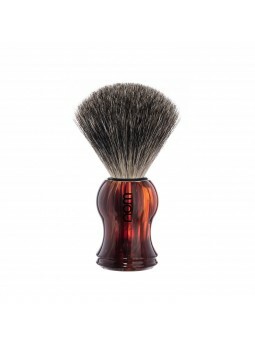 Shaving brush with pure bristle coloured and handle made of plastic, tortoise shell. This material taken from boars is harder than badger hair and produces the most bracing massage effect. 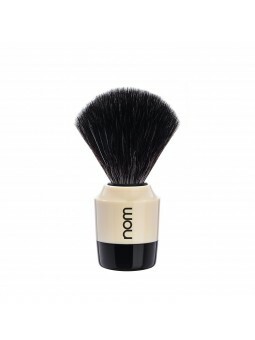 The bristle brush becomes softer with use. It offers inexpensive, easy entry into the world of wet shaving. Colors range from yellow to white. With a black imitation band as decoration. HJM Shaving Brush Black Badger Ivory Handle. Sound quality characterises for wet shavers who appreciate the massaging effect while preparing to shave. Shaving brush made with black badger and plastic handle ivory imitation color. Nom Shaving Brush Black Badger Tortoise Shell Handle. Sound quality characterises for wet shavers who appreciate the massaging effect while preparing to shave. Shaving brush made with black badger and plastic handle tortoise shell imitation color. 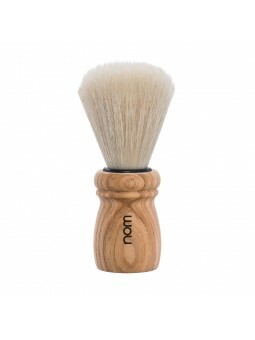 Nom Shaving brush, pure bristle coloured, plastic handle, ivory. This material taken from boars is harder than badger hair and produces the most bracing massage effect. 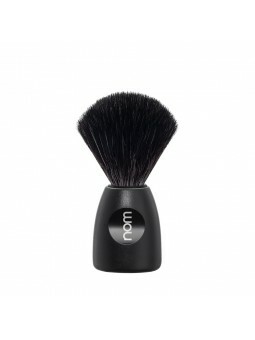 The bristle brush becomes softer with use. It offers inexpensive, easy entry into the world of wet shaving. Colors range from yellow to white. With a black imitation band as decoration.